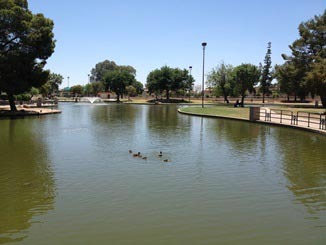 PHOENIX – As many as one thousand youth hunt/fish licenses will be given away free of charge at the third annual “Hook a Kid on Fishing” event on Saturday, April 8 at Bonsall Park in Glendale. The annual event was organized by Glendale City Councilmember Jamie Aldama in cooperation with the Glendale Chamber of Commerce, which will be sponsoring the giveaway of youth licenses. The giveaway coincides with a free fishing clinic — loaner rods will be available, no license is required, and bait will be provided. Licenses will go to the first 1,000 youth ages 10-17 during the event at Bonsall Park. Register on-site during clinic hours of 8 a.m. to 1 p.m.